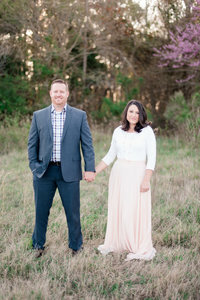 We knew from their engagement session that this couple would be so much fun! Brock & Bailey are some of the most genuine down to earth people you will ever meet! And on top of that such a good looking couple!!! We don’t think we could ever get enough of Brock & Bailey! Bernards Landing at Smith Mountain Lake was the setting of their gorgeous wedding. Before the wedding I have never heard of this place… However, I have fallen in love with the scenery and I will definitely find a way to go back! On the day of the wedding it called for rain. And of course like the rest of these past couple of months… it rained. The most wonderful thing though is that the rain cleared up and the sun came out right before Bailey was to walk down the aisle. It was perfect! Bailey’s style is very relaxed with hints of glamour and lots of fun. The florals from the wedding were absolutely gorgeous. They were colorful and had a wildflower feel. They even had a donut cake for their wedding which was absolutely perfect considering it was national donut day! The reception was seated under a tent and had string lights strung throughout. The couple had the most prettiest setup at their table under the lights. The day was absolutely perfect. These two are so much fun to be around and I am so excited to watch their lives unfold as husband and wife! Congratulations to the gorgeous couple and Luke & I cannot thank-you enough for having us along on your fun filled celebration!